Description: Brazilian Cherry, also known as Jatoba, is one of the most popular exotic hardwoods. It’s not difficult to see why: Brazilian Cherry's breathtaking reddish-brown heartwood is lined by dark black streaks, giving it not only contrast but amazing depth as well. The heartwood will darken over time to a softer red-brown. Beyond its beauty, Brazilian Cherry is incredibly strong, with a Janka hardness rating of 2350. Silica is a natural mineral deposit commonly found in Brazilian Cherry, which can appear as a milky discoloration on the surface of the wood. This natural mineral can be identified by thin white lines in the grain, which go all the way through the piece. As the wood darkens due to exposure these affected areas remain lighter and typically present themselves in the form of blotches and streaks. We make every effort to eliminate silica from our Select & Clear grade flooring, however, it is not uncommon for some boards to make it past the inspection process. Because silica is a naturally occurring mineral within the tree it is not considered a defect and is not basis for a claim. More Info: We specialize in both unfinished hardwood floors and prefinished flooring. Available width are 3", 4" and 5". Please see our product catalog for more information. 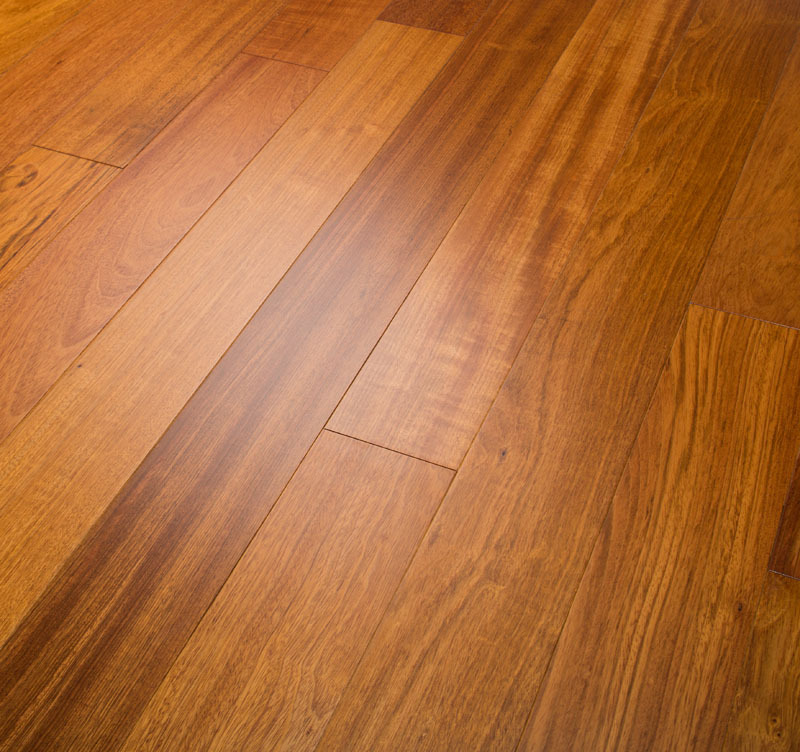 Nova is the largest importer of unfinished and prefinished solid Brazilian Cherry flooring in the US. We have inventory stock points throughout the US. Typical grades are Clear and Select, but occasionally we have #1 Common and Mountain grades; the Mountain grade will generally have up to a 70% sap allowance in each piece, creating a beautiful striping effect in the floor. Color: Brazilian Cherry heartwood can range from pinkish-red to brown-orange when it is fresh, transitioning to tan to reddish-brown when seasoned. The sapwood is typically gray, white, or pinkish in shade. Tree Characteristics: The Brazilian Cherry tree can grow to a height of 130 ft with the diameter of the trunk reaching 5 to 6 feet. The average tree height is 100 feet with a diameter of 2-4 feet. Geographic Area: Central America, the West Indies, northern Brazil, Bolivia, Peru, and Southern Mexico. The tree can typically be found on high riverbanks, ridges, or slopes. Durability Rating: Brazilian Cherry is rated as very durable. It is very resistant to brown-rot and white-rot fungi, and dry rot termites. Working Characteristics: Brazilian Cherry is rated as moderately difficult to saw and and machine as a result of high density. For planing purposes, it can be machined to a smooth surface. Planing can be complicated by the wood's interlocked grain. Gluing and finishing Brazilian Cherry is rated as easy. Applications: Railroad crossties, tree-nails, gear cogs, wheel rims, steam-bent parts, tool handles, decking, plywood, furniture, flooring.